James Wade’s brave bid to win the Masters crown for a second time was halted by Michael van Gerwen in the final. 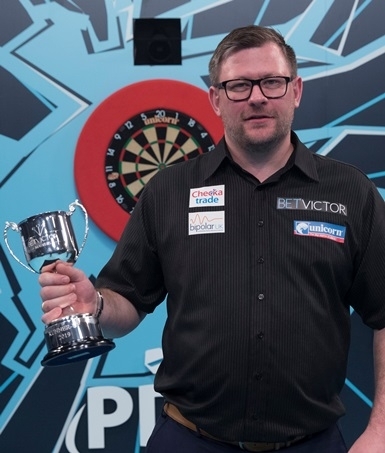 The World Champion claimed a 5th straight Masters title in Milton Keynes on Sunday night. He’s now beaten Wade in all 11 finals the pair have played. The big moment in the Final came in the 8th leg. Wade missed three darts to make it four apiece and the Dutchman pounced. He broke throw, took out 124 on the bull for a second time and then hit a superb 170 finish. Wade responded with an 11 darter but there was no way back. Van Gerwen won seven out of nine legs to take the Masters title yet again. Earlier Wade’s finishing won a tight semi-final with Peter Wright. In a match which saw 11 breaks of throw, the Unicorn man found that extra gear when it really mattered. Wright managed to open up a 9-7 lead, but that was the signal for Wade and he produced some stunning darts to win four legs on the spin and take his place in the Masters final. A 104 check-out in the 19th leg and he won it on D10.....he was 5/6 on D10 and it did the trick. In the all Unicorn quarter-final, Wade fought back again. This time he was 4-0 down to Joe Cullen, who missed darts to go 5-1 in front and Wade pounced. He reeled off seven consecutive legs....an 11 darter, two 12 darters, five 180s and a 140 finish. In those seven legs ‘The Machine’ averaged 108 and Cullen couldn’t respond. Wade won it with a 101 finish. But it was another missed opportunity for Michael Smith. Unfortunately the Unicorn man couldn’t find any consistency as he lost 10-6 to Wright in the quarters. He was lucky to hold throw early on after Wright missed nine darts to break. The first key moment came in the 8th leg when the Unicorn man missed four darts himself to break for a 5-3 lead. In the very next leg Wright struck with the first break and a lead he wouldn’t relinquish. Smith tried to hit back as a couple of 12 darters kept him in it, but Wright always looked the more likely and he won it with a 101 finish.